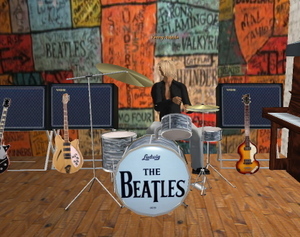 Virtual Vibe Jazz Fest presented by USC Center for Public Diplomacy starts bright and eary Friday October 26 6 am SLT. Should be a terrific event with some great players gathering from all over the world to come into Second Life. One of the pleasures of working with the guys at the Hive is how creative they are. Case in point, I had asked them to begin to develop some poster ideas to promote Second Life around the college, and also to reflect some of the "cool factor" of working in virtual worlds back to their peers. 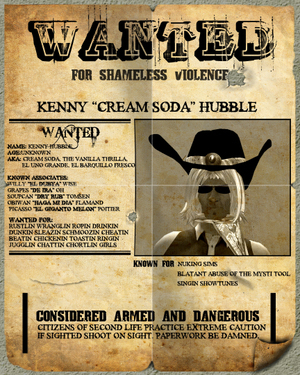 The range of ideas that they come up with are terrific, including this awesome wanted poster for Kenny Hubble. As they create more posters I will share them here. Great work guys! Last night we welcomed Bob Logan, physicist, media ecologist and author to speak at the Media Ecology series in Second Life. The event was streamed live by SLCN.TV, and an archive of the entire presentation can be found here. What was interesting and exciting for the audience present in Second Life, in addition to a swarm of ideas that Logan's talk addressed, was that we were experiencing Logan's first steps in Second Life. His comments about the form itself amused and delighted the audience, who participated actively in responding to Logan's ideas. 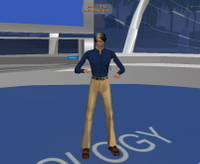 There was a demonstration during the discussion session where avatars morphed into various forms and costume, and we all witnessed Bob Logan flying for the first time. Professor BobLogan Schmooz presented his ideas of the development of culture through such foundational media as the alphabet, an idea he collaborated with Marshall McLuhan on in the 1970's. Logan's latest works expand McLuhan's seminal work Understanding Media, into the New Media era, addressing technologies such as cell phones, blogs, wikis, and even virtual worlds. To learn more about Bob Logan, visit his webspace or The Beale Institute for Strategic Creativity.